Harkness Screens, the world’s leading manufacturer of cinema screens and front and rear projection surfaces for live events such as concerts, theatre productions and outdoor screenings has provided its popular Stagelite White/Black surface for the forthcoming Academy of Motion Picture Arts and Sciences’ “Oscars Outdoors” summer series. 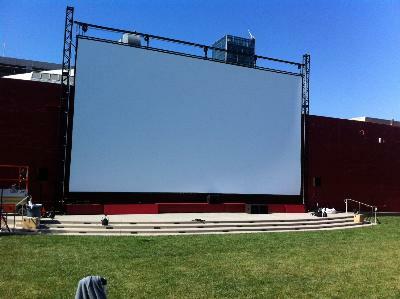 The 40’ x 22.5’ black bordered Stagelite White/Black 100 screen has been installed at the Academy’s open-air theater at its 7.5-acre campus on Vine Street in the heart of Hollywood. “We were delighted to supply the Stagelite White/Black surface for the festival, says Keith Watanabe, Americas Sales Director at Harkness Screens. “The Academy has always set the benchmark for film presentation and doubtless the festival will once again prove to be a major success with impeccable projection”. Stagelite White event screens are flexible PVC front projection surfaces available as made up screens or off roll. Stagelite White 100 and Stagelite White 100 Super are general purpose contrast screen intended for a variety of auditoria, generally in dark conditions. Stagelite White/Black 100 is similar to Matt White 100 with a black reverse side for blocking ambient light behind the screen. For more information on Oscars Outdoors, visit www.oscars.org/outdoors.